Hi, I was told by the surgeon that my cheilectomy and toe fushion was not straight forward as one of the screws had broken the 1st metarsal bone. My foot now in plaster for six weeks in total. I feel he has perhaps not taken enough care. Am I right to feel this, or is this a common occurrence? He stated also that the bone was very arthritic. Surely he would have drilled a pilot hole! I would value your view on this. I have mentioned this many times on my site (and to my patients) that there are no guarantees in surgery, in any part of the body. What looks good on the drawing board does not always translate well on the operating room table. Unfortunately, complications are an every day part of surgery. The sad part in your case is that you underwent elective surgery; this was not a life or limb threatening problem and I would hope that you at least tried conservative options prior to consenting to surgery. I would also have hoped that your doctor offered you non-surgical options to try prior to consenting to surgery. In any event, this is all water under the bridge and now you are left with dealing with the consequences. Keep in mind that I am answering your question on the basis of your narrative and your narrative alone as I do not have the luxury of examining you and you have not enclosed any images of your recent x-ray. You state you are in a plaster cast. I hope you are also non-weight bearing but you do not mention that possibility. You also do not mention if this complication occurred during surgery or perhaps right after surgery as it was picked up on a post-operative x-ray. Or, is this a problem that has developed as a result of you walking on the foot? Knowing the answers to these questions would be helpful in evaluating your situation. But, in any event I will try and give you some guidance. keeping the patient non-weightbearing. So, once again, it would be nice to know if you were non-weightbearing and did the bone break during surgery or did it break once you started walking? If the bone broke when the screw was inserted during surgery, then at the very least, additional fixation should have been applied to support the broken bone. You mention the metatarsal bone was very arthritic, but the reality is in most cases people who undergo this procedure do so because they have an arthritic big toe joint. I personally do not like fusions for this problem, but that does not mean they are not done on a regular basis. 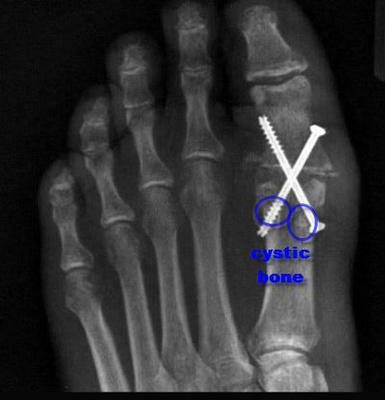 The problem would be if the first metatarsal bone stock was cystic, meaning it was not solid bone and cystic bone is seen quite often in very arthritic joints (represented by blue circles). The problem with cystic bone is that it will not hold screws and worsen than that fractures easily. The same would hold true if you suffer from severe osteoporosis. When I open up the joint one of the first things I look at is the quality of the bone, particularly if I have intentions of cutting into the bone. If I see that the bone stock is weak I change my plans and do a different procedure. I have no way of knowing what was going through your surgeon's mind, nor what he saw when he opened your foot. So as you can see there is a lot of unanswered questions and without these answers I cannot be definitive in my advice to you. If you think you did not get adequate care then the best way to approach this problem would be to get another opinion from a qualified foot specialist in your area as this doctor will be able to ask the necessary questions (similar to the ones I have asked) and will be able to examine your foot and view x-rays. That way you will be given a fair assessment of your problem and what hurdles you may have going forward. The surgeon did state that injections into the joint was an option, but there was a possibility of infection. He would not advise this given the limitations of movement of only 20% in the right big toe. I have no x-ray pictures of my feet as they do not give them to you in the U.K. He showed me them on a computer screen in the consultation room. His recommendation, given the level of pain in the right foot, was a cheilectomy and fusion as there was no cartilage. I also had a left foot scarf akin osteotomy done at the same time. The surgeon told me the bone had broken when he was screwing in one the cortex screw's during the operation. I have been told partial weight bearing on both feet. I am also wearing a pair of Darco velcro shoes which only allow weight through the heels. I have another appointment in four weeks time and will put these questions to him. I am fifty eight years old and paid privately for this operation as I had been waiting for five months on our National Health Service. Call me old fashioned but I would never do both procedures that you had done, at the same time, simply because when there is a complication there is not much "wiggle room" for maneuvering around the problem. Specifically, the standard of care would be to put the fractured foot non-weightbearing immediately so that the fractured metatarsal bone has the best chance of healing. That is pretty hard to do when the other foot has just had surgery, let alone when a Scarf-Akin has just been performed on the foot that you are supposed to bear weight on. I suppose part of the problem here is your health care system in the U.K., meaning that if you are paying out of your own pocket, it would have been even more expensive to have each foot done at a different time, so your surgeon decided to do them both at the same time. Again, without x-rays to review I cannot give you a prognosis, but as I stated earlier, if you have any doubts about the quality of care you are receiving, then you should consult with a local foot specialist.